Budley's is a full service restaurant offering hot meals, sandwiches and snacks along with a full licensed bar. We pride ourselves on our homemade baked goods prepared from scratch daily. Daily specials are offered including roast beef dinner to fish cakes and homemade baked beans. 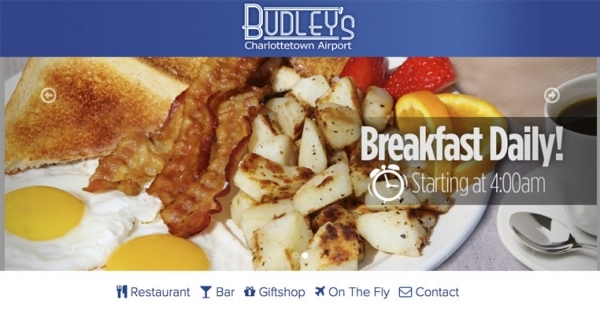 Located post security, Budley's "On the Fly" is a full licensed lounge, with a varied selection of food offerings including hot soup, breakfast sandwiches and many quick take-away snacks to enjoy on your flight. Adjacent to Budley's Restaurant is a gift shop that offers many local Island products. If you are looking for a souvenir to remember your vacation or take home to a loved one or if you want to brush up on your cooking skills with a selection of recipes from Michael Smith's cook books, you will find it all here. Budley's "On the Fly" also offers a wide variety of preserves, spices and much more from the Island Preserve Company. Various vending machines are available for your convenience.